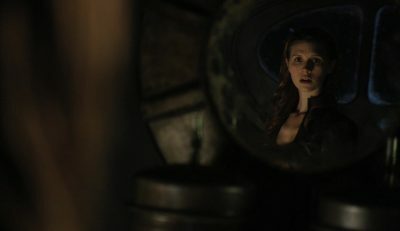 The question of what is the greater good is asked of many of the crew of Destiny in this episode as the ship comes across an alien derelict. Without a shuttle the decision is made to leap across the void (in the space suits) and employ a Kino as motive force and to string a connecting rope to aid the second person across. Colonel Young and Rush both volunteer and are probably both being a little paranoid but the unlikely couple do make it across safe and sound and enter the alien ship through a rupture in its hull. Rush is able to secure a compartment and bring power up and sends the Kino in search mode, they discover the alien pods they found previously on the Seed ship and unfortunately trigger an energy surge which propels the ship far away from Destiny. The Great Good was an excellent episode, some of the CGI visuals where stunning more so because they were slow and deliberate allowing you to appreciate the detail the artists applied to their computer constructed models. The continued relationship between Ginn and Eli is fantastic and Amanda and Rush spark as you would expect. The highlight of the episode barring Eli getting seriously pissed when he discovers Rush’s betrayal is the dialogue heavy discussion between Young and Rush, two great actors performing with a good script and twenty six episodes of character growth behind them. Our continued thanks to Brad for joining us this week and the featured promo was for Generations Geek. Next week since it will be December we will be dipping into this season’s bonus episodes recording over this last year. Up first will be the episode “Penance” from Sanctuary which guest starred Michael Shanks so we hope you can join us for that and of course we’d love to know what you thought of the episode.